This group project was done as part of a field studies research class. For 10 weeks we spent researching about waste specifically the life cycle of an object. I collaborated with three other interaction design students who are Naoki Hisamoto, Chloe Lee, and Hsuan-Ting Wu. Together we did the research, affinity diagramming, and ideation. Naoki was the filmmaker, Chloe was the head writer, Hsuan-Ting was the transcriber, and I was the mobile application lead. Revive is a digital platform that promotes neighborhood-based freecycling. Freecycling is the act of giving away usable unwanted items to others. The concept of freecycling is gaining popularity, but lacks refinement and designated platforms. 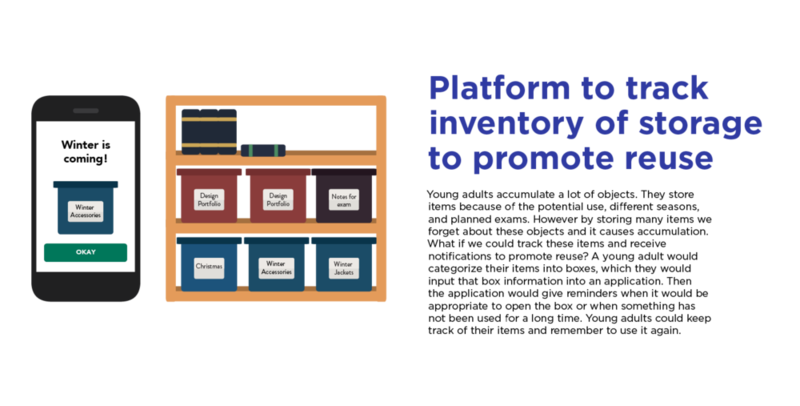 Revive provides that platform, and takes the repurposing one step further by not only preventing objects from going to the landfill, but inspires users to part with static objects in their lives to help others. The two biggest design challenges we faced were deciding the language to describe the problem space and deciding at what point in the object lifecycle should design intervene. Our problem space is people accumulate too many possessions. We began to identify our this space through secondary research. We examined object attachment habits. The most common scenarios we came across were extreme cases of hoarding. Our biggest takeaway from the secondary research was what we didn’t want to design. We wanted to look more heavily into the space surrounding object accumulation before it becomes trash. We planned to investigate the more present everyday scenarios of people just like you and I who have stuff they don't use. We began to conduct interviews with 20–25 year olds that have at least moved once and have an occupation. We wanted to understand the social and economic factors that contribute to object accumulation in young adults. Even though I have conducted interviews before the plan of action was different. Before I had generated a list of questions and strictly followed the questions. For these interviews, I analyzed the responses while asking target questions that would probe deeper. As a result, there were many awkward pauses and similar answers; however after conducting more interviews I improved my research skills. The affinity diagramming phase began by cataloging all the data we accumulated during the interview. This included quotes, questions, idea and photos. The second phase involved grouping all of our primary data and making surface level groups of content. The third phase was putting the data back into the context of our research to begin forming significant insights. It revealed further trends, groups, and let us step back and reflect on what we were learning from the data. One of the main insights we derived was personal associations with possession often forge a significant connection to the object, whether we like it or not. Objects have the potential to hold personal connections and associations with them. Although this often perceived as a positive association, it can leave owners with unwanted items that they feel obligated to hold on to. Another insight was proximity plays a key role in second hand buying and selling. The mystery of previous or future owners can make secondhand buying and selling feel unapproachable and daunting. Having any connection with the other party involved increases the probability of secondhand exchanges. These were of the many insights that we found in our data. There are three to four phases in an object lifecycle, which are buy, own, sell or waste. We wanted to focus when the object is no longer useful to the owner but still has enough value to remain in their life, where the object often goes into storage and becomes dormant. 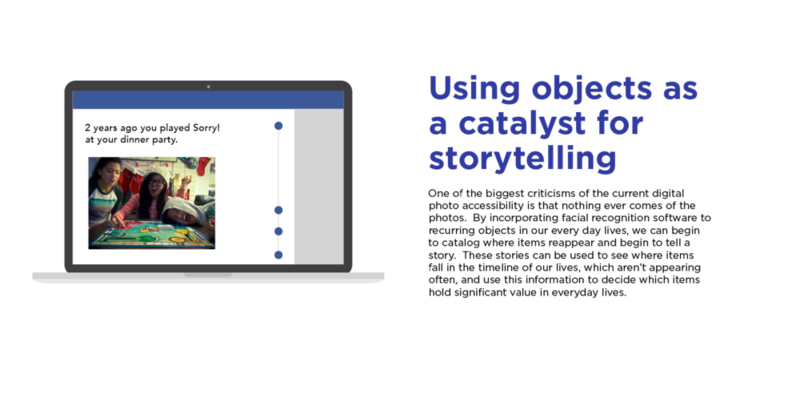 We wanted to target this point in the object lifecycle when it still has both practical and emotional value. The practical value makes it appealing to a second hand user, and the emotional value is why the owner holds on to it. By transferring ownership when the object is static to the owner, it brings the object back to life. 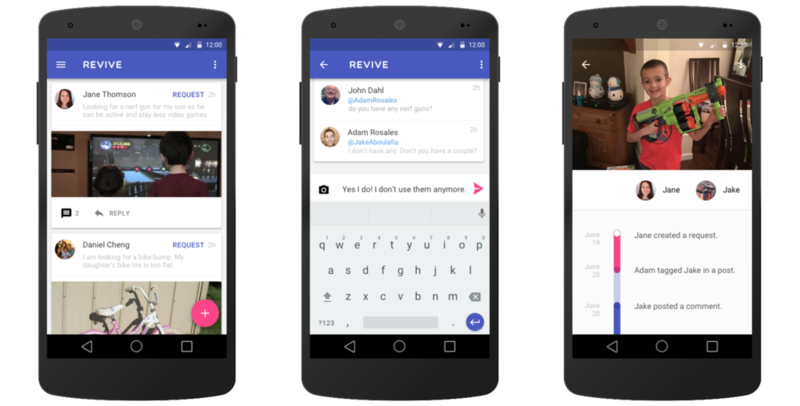 Revive uses location based services to connect users in their neighborhood. Revive uses storytelling to inspire people to give away possessions they've been holding on to. These objects are both resources and facilitator for connection in the community. The emotional barriers that prevent people from getting rid of possessions are broken down by Revive. Emotional connections not only help rid of existing memories, but to forge new ones as well. Beyond the foundation of what is going to make Revive function, we are looking to the future to see what can become of the platform. By spending so much time in research and data synthesis, I saw how a data point became an insight to a concept. We were able to back up our design decisions through research. It was extremely rewarding to create this product. Also, working in a diverse group we were able to share our skills to each other.